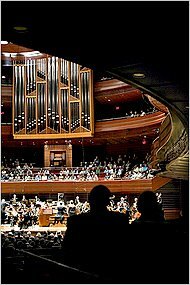 The world's best orchestra got a new monster pipe organ. Guess which piece they played to premiere its honking bass and screaming hooks? Oh, yeah, baby, that's right. Sorry I wasn't there for this. Kimmel Hall is indeed a great space, but it'll never replace the AoM, at which I spent many happy hours...often backstage during concerts, chatting with the tympani player, hearing pieces that still bring to mind the golden dust that would descend over the audience from the crumbling ceiling whenever the orchestra would emit a particularly ear-shattering blast---like something from Milton.